Someone always wins the day on Facebook. Today, it’s my mother-in-law, Elaine. She’s having cake and lemonade on the lawn at Welty House in Jackson, Miss. Doesn’t that sound like exactly the way you should be spending a gorgeous spring day – having cake and lemonade on the lawn? If I’d realized sooner that today was her birthday, I would have made Ms. Welty’s Vicksburg Potato Salad. But I didn’t. So, I made another Southern spring classic, a so-wrong-it’s-right Baked Pineapple Casserole. It’s the sort of golden mystery dish you might find bubbling away on a Southern granny’s Easter table, since pineapple goes so well with ham. To appreciate this casserole, you have to refrain from passing judgment on its ingredients: crushed pineapple, sugar, Ritz cracker crumbs, butter and cheddar cheese. You have to accept the logic that, if pineapple and cheese go together, and cheese and crackers go together, then pineapple, crackers and cheese are perfectly fine together. The pineapple is extra sweet from being combined with the sugar, so it contrasts even more with the savoriness of the cheese. Then the cracker crumbs, which are layered throughout the casserole, absorb some of the pineapple juice and butter from the bottom and thicken the casserole, giving it some body. Under the surface, the texture is similar to a Ritz Mock Apple Pie, only with crushed pineapple instead of no fruit at all. However, those cracker crumbs stay nice and crunchy on top. Some people serve this casserole for dessert, but it’s a great side dish for pork, especially something like a good Coca-Cola ham. With the last of the summer’s put-up green beans, creamed corn, Sister Schubert’s rolls and potato salad. Followed by cake and lemonade on the lawn. I mean, doesn’t that sound nice? Welty House knows how to party. Pour the crushed pineapple (juice and all) into a small saucepan, and warm it over low heat. Add sugar. Heat until the sugar is dissolved, and then remove from the heat. 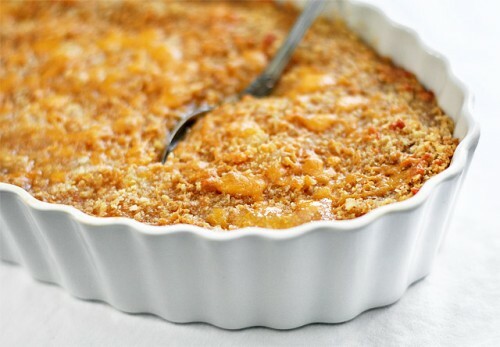 In a casserole or baking dish, layer the pineapple mixture, cracker crumbs, butter and cheese. Repeat until you have three to four layers. Sprinkle the remaining 1/4 cup cheese on top of the casserole. Bake uncovered for about 20 to 25 minutes, until bubbly and golden brown. Funny, I was thinking about this dish just today! Yours looks beautiful, and you're right, it complements a ham perfectly! YUM! My mom makes a pineapple spoonbread each Easter and I think this may be a nice change! Got to try this one, sounds down right perfect! This is delicious with ham. I am so making this and pulling out my copy of TOD and sitting out on the deck Sunday afternoon, weather permitting, while we grill something southern to have with this and tomato sandwiches and lemonade…okay, it's not the Welty House or The Faulkner House down the road, but it's as close as I can get right now. I have always wanted to try this because I am, as it is, skeptical about all those flavors touching. Hope you are well. Oh wow. Never heard of this, but I love it already. It's got to be good I reckon seeing as how every type of food from the South is! Rebecca, the Sweet Potato Queens would completely approve of this recipe! this looks delicious and never something I would've thought of. Who thinks about baking pineapple with cheese and crackers. No one. But the southeners. I love this casserole! My mother made it years ago from Aunt Bee's Mayberry Cookbook. Will have to make this very soon – comfort in a dish. This looks great! I've never heard of anything like this before! I can just imagine how great it tastes with ham! I've made this many times. I never put 1 1/2 cups of sugar. Just too sweet. I use about half of that amount. I assume you'd use just a mild colby, and not something aged and sharp for the cheese? Great dish…such a traditional southern side! From the south and lived in TX for a while and none of my friends knew what it was until we took a trip to North Carolina! They weren't too keen on the idea, but I love love this dish!! This is so strange sounding! I really love the idea though. Yum! Oh wow — pineapple, Ritz crackers and cheddar? Sounds too strange not to be delicious, to be honest! Salty, sweet and tangy… I might have to break my no-baking-treats rule and give this one a try. I have to try this, I cant imagine the taste but It must be good. My cousin has been making this dish for years for every family event. Years! And it's so good. I hate to admit how good it is. It is a great side with ham! I use much less sugar … maybe 1/4 cup max. so simple, but it looks so delicious! I would probably serve this with ham like you suggested. Yum! I just made this for Easter dinner. First off, the smell as it was baking made the whole house go insane. It was heavenly. Second, after the first bite I think I can honestly say it is the most delicious thing I ever ate! This is going to be a holiday staple. Plus I know what I'm making for every pot luck from now on. YUM! My family has been making a version of this for a few years now. We use cheddar crackers on top of the cheese to make an even bigger punch. Here is how we do it: http://www.twin-tables.com/search?q=pineapple+cas…. Thanks for your great recipe. I have been reading your blog for years and never left a comment. It is a delight. Thanks for the Welty shout-out! I can't believe that I missed this post; I really do check your blog all the time. I must have consumed too much lemonade or ate too much cake or both!